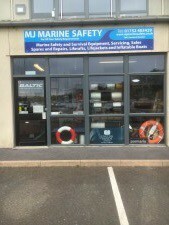 MJ Marine Safety is a family-run business that was started in 2006 at the developing Yacht Haven Quay providing dry-berthing and a boat-stowage facility here in Plymouth. Martin''s career in Safety Equipment started off in the Royal Air Force in 1983 as a Safety Equipment Fitter. On being attached to the Parachute Regiment at Aldershot Martin served in several regions of the world servicing safety equipment. Martin''s next posting was at the School of Combat, Survival and Rescue and Trials here at Plymouth at what was Royal Air Force Mountbatten, where he then became a Survival Instructor and and trialled various new and weird safety equipment. Martin stayed with the School of Combat Survival and Rescue when Royal Air Force Mountbatten was closed down and was posted to RAF St Mawgan. It was there that he was awarded and mentioned in the Queen''s Birthday honours list for his work on safety equipment for the Bosnia and Gulf War conflicts. Since leaving the Royal Air Force, Martin has become a Royal Yachting Association Sea Survival Instructor and also a STCW and Seafishies Sea Survival Instructor. He has also set up three approved MCA Liferaft servicing stations for previous companies and is The Plymouth Lifeboat Sea Safety Officer for the RNLI Sea Check Team in Plymouth. We are able to give talks and demostrations for your club or Scout group ect. Also Martin has now become a Retained Fire Fighter at his local Community Fire Station at Plymstock with the Devon and Somerset Fire and Rescue Service and part of his duties is being the Coxwain of the Fire Boat Viliges, So if you see the fire boat on the water give it a wave, it could be Martin at the Helm ! Along side this Martin has now been trainined up with Her Majesty''s Coast Guard Search and Rescue and since joining the Mountbatten (Plymouth) Team and has passed his Cliff Rescue technician course to become a Coast Guard Rescue Officer for the Plymouth Team. It was because of the demise of his previous employer that prompted him to start MJ Marine Safety. Approved Service agent for Waypoint Liferafts ISO 9650 commerical / Charter and ocean Going. Approved Service agents for Spinlock, Baltic and Parmaris Life Jackets. We hold spares for the above life jackets and many many more makes. 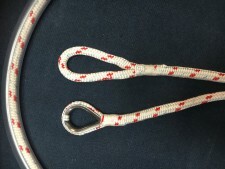 MJ Marine Safety now offer an Splicing Service,We can offer Natural fibre or synthetic cordage. See our splicing page. Also look out for our new pages on English Braids ropes and cordage. Our Electronics section with a wide range of Brands such as Garmin, Raymarine, Icom just to name a few. Also Our fire Fighting and Fire Protection page with a range from a 1 Kilo fire extinguisher upto fire training systems, cabinets and stands. Do you know what your life raft looks like out of that "white box" or "bag" why not have it serviced and watch it being opened up at the same time. I will be able to the give you a talk on your life raft and the equipment that is inside your life raft and what you haven't got inside your life raft. Booking for this is essential and the talk will be in the region of 1-2 hours and you will be welcome to take photographs of your life raft during the opening. But your life raft will not be finished on the same day! Also MJ Marine Safety can now supply Beaver Sports Diving Equipment including repairs. The web site is constantly being updated with safety tips and safety information so please check back to see whats new. for purchase or hire and further information contact Martin. Please note carriage charges will apply to items sent by courier. Prices indicated are subject to change and availability and exclude carriage. Terms and conditions are BMF Edition 14 and are available on request. All Pyrotechnics are local deliverly or collection only due to hazardous Goods Act.